Autism Society Philippines, along with the Association of the Visually Impaired and Down Syndrome Association of the Philippines, partnered with SM City BF Homes, Paranaque to conduct the Caring for Special Customers and Persons with Disability seminar last 11 July2014 at the 1st Floor of the SM City, BF Homes, Parañaque City. 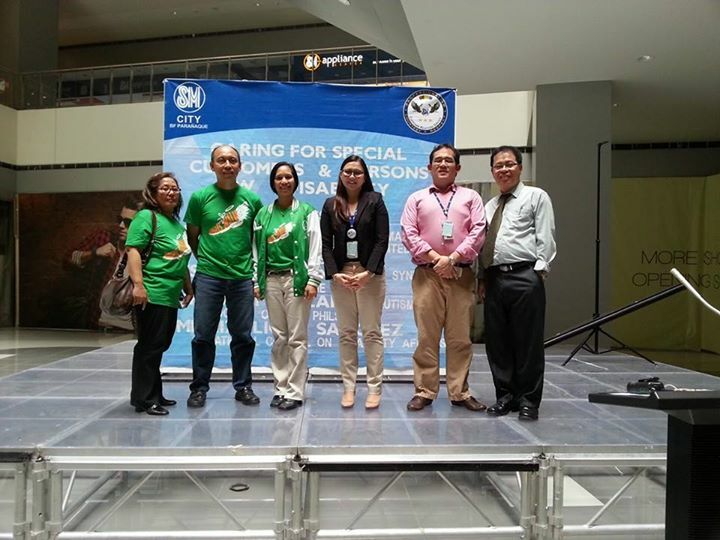 This was the first Caring for PWD seminar held at the mall since it opened last November 2013. About 130 employees, mostly security guards, janitors and sales persons came to attend the seminar. Some officers of SM City BF Homes were also present. The seminar aimed to educate SM's front liners about the different disability groups; and how to assist and handle them as customers to ensure their safety and convenience while they are in the premises of SM mall. Mr. Jimmy Silva, Chairman Committee on Accessibility (United Architects of the Philippines) talked about the needs of blind and visually impaired persons and the proper way of assisting them. Mrs. Agnes Lapena (Down Syndrome Association of the Philippines) who introduced her son Jeremy, while giving a presentation on Down Syndrome and its challenges. Mr. Evert Malapad (Autism Society Philippines) gave an overview of the stigma and major challenges of persons with autism and the proper approach and assistance to give them when they are in public places like the SM malls. Mr. Rizalio Sanchez (National Council on Disability Affairs) talked about the laws and policies to ensure the protection of civil and political rights of persons with disability. The seminar was a big success and a learning experience to the new employees of SM City BF Homes. We look forward for the next batch in December this year. About the author. Imee Alviso is an ex-operating room nurse at Saint Lukes is now a full-time mom. She acts as driver, tutor and therapist to her bunso with autism. She loves to sing, dance, play guitar, play badminton and swim with her three kids. With the loving support of her expatriated husband, Imee serves as President of ASP Parañaque.